in the Gulf, and listening to the waves hit the shore is bliss. saving that food adventure for tomorrow. Next Post What Are You Smokin’? That looks like perfect beach food to me! I’m loving the daily report from Apalachicola. Looking forward to reading about the smoking adventure. Good is not the word for this dish. Delicious is not the word for this dish. I can’t actually think of the appropriate word to describe the way I feel so $(%^$_(*^(*YY#$# that it is not in front of me RIGHT NOW! I second that. Make mine without the pasta, I prefer to soak it all up with bread. the weather in the Northeast is still too cool. Steaming up a pot of these is the perfect compensation. Sounds deliciously fragrant. Nothing better than buying local fish, isn’t it? This meal means to me ,summer !! Nice photo.Congratulations !!!! Looks great. I’ve never eaten clams. Lydia, it IS perfect beach food because we were able to come right home from the beach and eat. 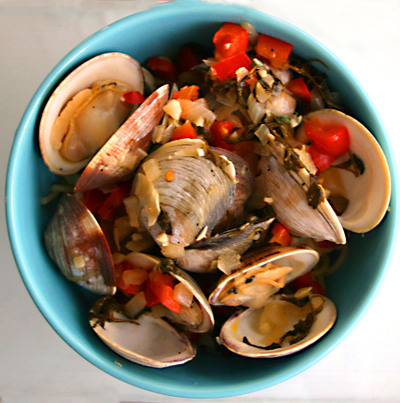 It only took about 15 minutes to prepare, once we picked up the clams. Ronnie, the smoking adventure continues. The smoked mullet dip we made is better than the grouper dip!!!! You too, Mary. And you are right — the broth is the best part. Should be warming up there pretty soon, though, Susan, no? No, Bea, nothing better, and it’s something we really miss in Indiana. I’ve never been wild about them, Cynthia, but I think I’ll have to reconsider. These smelled incredible.